"T L CONSULTING" is a law office that offers legal help and consulting to people and legal entities for the defence of their rights and legal interests before state authorities, administrations on different levels, courts and special jurisdictions in the Republic of Bulgaria, as well as in the Court of Justice of the European Union, the European Human Rights Court and other international institutions. "T L CONSULTING" law office is Your partner in solving problems in the areas of trade law, civil law, administrative law and procedure and European Union law, including the implementing of solutions of cases involving high level of complexity. 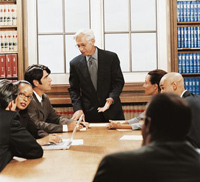 The law office guarantees a competent and secure defence of corporate and individual interests. We insist upon the quality and professionalism of our acknowledged specialists, upon the careful analysis of every situation, upon the responsibility and optimal results. Our team constantly enriches its knowledge and responds adequately to the changes that have taken place after Bulgaria joined the European Union. Our key guiding principles in work are: honesty, integrity, professionalism, loyalty, confidentiality, efficiency. The objective of this website is to present information of the activity of the "T L CONSULTING" law office and the services, which it offers. If You need a legal advice, do not hesitate to contact us and to discuss all facts and circumstances, which could be related to solving the problem of Your interest.